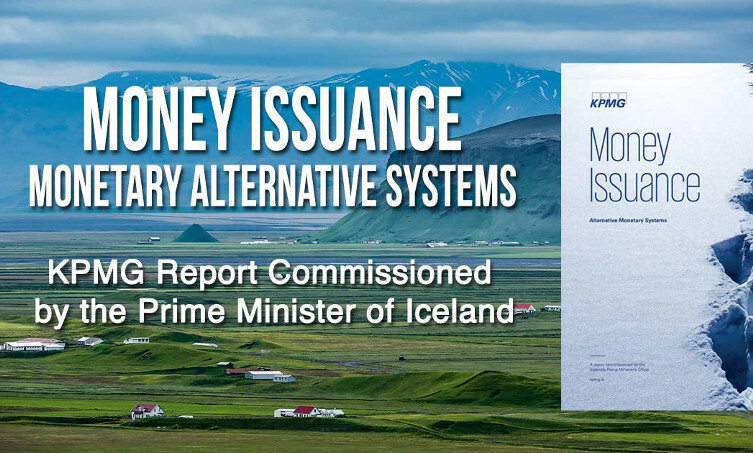 On September 5th, the consulting company KPMG released a new report commissioned by the Prime Minister of Iceland aiming to clarify the main features of a sovereign money system as advocated by the IMMR. The launch event in Reykjavik featured a very supportive speech from the Financial Times’ chief economists commentator Martin Wolf and was commented by the Governor of the Central Bank of Iceland. One knows a subject is being taken seriously when the world’s biggest consultancies and accountancy firms such as KPMG start looking at them. The monetary reform movement just passed this milestone this week after KPMG Iceland released a new report entitled “Money Issuance: Alternative Monetary Systems”. The ~40 page report (pdf) was commissioned by the Prime Minister’s office. It provides an overview of the sovereign money proposal, including a summary of the latest political developments and the academic debate. While the report is quite accessible to read, it does not provide any recommendations on whether sovereign money should be implemented or not. However, it sparked a fascinating debate during the launch conference on Monday September 5th in Reykjavik. The event started with a short introduction from a representative for the Prime Minister of Iceland (who commissioned the report). Then Sigurvin Sigurjonsson, an analyst at KPMG and lead author of the report, explained how the current monetary system, in which banks create most of the money when they lend, is difficult for central banks to control. In the proposed sovereign money system, all money is created exclusively by the central banks, and new money is either added to the government’s finances and spent into the real economy, or is lent to banks and other firms that will lend to businesses in the real economy. He also covered some of the key publications on sovereign money. For example, the recent Bank of England working paper on The Macroeconomics of Central Bank Digital Currencies actually models the implications of a central bank created new money and putting it into the economy, with significant economic benefits. This model is not strictly a sovereign money system, but gives some insight into the potential benefits of central banks creating money in the public interest. The academic debate around the subject is still young, with few papers on extensively discussing the topic. The report says there was consensus on the fact that sovereign money would lower public and private debt levels and inflation, but there was uncertainty or disagreement around the impact on bank liquidity and credit, and interest rates. There are also significant questions around the complexity of transitioning away from the current monetary system. The Governor seemed to be confused about some aspects of sovereign money, arguing that it would end maturity transformation (the process of converting short-term savings accounts into long-term loans), which is wrong. He also thought that a sovereign money system amounts to nationalisation of lending, whereas in reality it privatises the lending business by removing the state support and safety nets that banks currently receive. The Governor repeated the usual central bank line that they are able to manage money creation by banks through a combination of interest rates, reserve requirements and other policies. He argued (correctly) that the Icelandic banks are now much smaller and safer than before the financial crisis. In addition, Guðmundsson argued that sovereign money proposals focus on the money creation problem, whereas the financial crisis was actually a financial stability problem. “You want your money to be the one thing that is completely safe when everything else goes to hell”, said Wolf, but the design of the banking means that it’s impossible for banks to provide this safety. It requires government support – guarantees from the central bank and the Treasury – to keep the system safe, but these guarantees are “a gigantic source of moral hazard”. Have a much stronger impact on stimulating the economy than current measures like QE. Wolf thinks there are possibly two key measures that could be undertaken in the short run. First, he said something like ‘helicopter money’ whereby central banks would distribute money directly to citizens was quite likely to happen. Second, central banks could issue their own digital currencies to provide a safe version of electronic money to citizens, alongside with existing banking deposits. Wolf however warned that a key issue was the independence of central banks, which needs to be preserved under a sovereign money system. But after all, the independence of central banks was thought as being impossible in the past, so there is no reason we cannot modernise those institutional arrangements with a sovereign money system. So who should do it first? The Governor joked that whilst Iceland could not experiment with a sovereign money system due to its membership of the European Economic Area [although we think this point is incorrect], the UK has just voted to leave the EU and so should be the first to experiment! MP Frosti Sigurjonsso, who authored a first report to the Icelandic PM in 2014, disagreed with the Governor: “We [Iceland] are one of the most democratic nations. We can take initiative, we can change the system.” he claimed. Despite its many concerns, the Governor Guðmundsson said the central bank will take the report and look into these issues in more detail. To fully discuss the issues around the current monetary system and the sovereign money system he suggested the central bank staff should lock itself for 3 days in their offices, and that they needed “a thousand pages of research” to answer all the questions. However, we may not have time for that, Wolf argued. We’re now past the point of discussing how to deal with the last crisis; the discussion around sovereign money is now about how we deal with the next crisis. Download the full report here and watch the recording of the event here. New money must call upon the approval of the electorate. When created it must be for a specific goal. That goal should be a long lasting NEW asset that will assist the entire nation such as a road, hospital, etc and its value must be equal to the new money created. Iceland’s free financial thinking is a tonic to us all. They dare to vocalise that our present world financial system is broken! Iceland dares to believe we can change the system, such a big idea from such s small country! Let their illuminated thinking alight the world! The current monetary policy operated by the government has made it impossible for them to honour the social contract that they have with the population. The social contract in which we have consented to surrender some freedoms to the Government in exchange for the protection of our rights, is after all in place to underpin the legitimacy of the government. We see this breach of the social contract through the ongoing underfunding and degradation of all our public institutions such as the NHS, local government or the civil service. The adoption of a Sovereign Money system could compel high street banks to lend a proportionate amount of the money, which they have auctioned for from the Central Bank, into the real economy. The tax take from such a re-invigorated economy would once again stabilize our national institutions and massage the social disquiet we see demonstrated with ever increasing frequency. This statement reflects monetary thinking that is totally locked into the paradigm of commodity based currencies. Such currencies when first issued had, logistically, to be issued from a central point. With fiat currencies, which have a face value, but no backing value, on issuance, the issuing of new currency at the point of individual purchase has become quite economically realisable. It is now, with smart phones to serve as electronic wallets, also quite technically feasible. In addition individual need is the only economically sound reason for issuing new currency. Banks will never, and should never, have to deal with the issuance of new currency. Banks should only handle old currency. New currency would be issued electronically, from a central currency authority[CCA], as non-interest paying debt to the individual concerned. In order to prevent inflation the individual’s new money debt would never be alowed to exceed a fixed limit. New money debt would be settled as the individual earned money. Thus the first port of call for all monetary transactions, deposits or withdrawals, would have to be the CCA. The CCA would have to keep a new money account for every individual, the banking system would remain as is, except that there would be no unbanked individuals, everybody would have to have a bank account. Money system induced inflation would no longer exist. Physical currency would be totally replaced with a digital currency. A digital currency would enable an end to currency anonymity by keeping a digital record of the identities of the holders of every unit of currency. Criminal activities reliant on the current anonymity of currency would no longer be viable. Wow! Iceland leads the way again, this is really an amazing and positive development. Let’s hope that it bears fruit – there is no way for the west to rescue social and political democracy without reforming the monetary/banking system. A country must be brave enough to take the step. We in New Zealand thought we might be first but perhaps it is little Iceland the Brave that will step up and be first. THE PEOPLE OF ICELAND MUST BE VERY PROUD ABOUT THERES GOVERMENT AND ADMINISTRATION. Im just enterIng this matter and i am really excited to read this Kind of positive developements. It shall change the world hopefully. HUH! I am encouraged by the latest news and hope our current monetary system will become better understood by the general public, thereby recognizing the need for monetary reform. I would also like to thank the people of Positive Money and other organizations for their continued efforts in this field. The labour party leader is open to returning social responsibility to the Commons. Getting his approval appears a necessary preliminary step to Britain spear-heading this initiative.